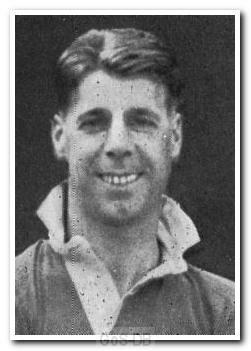 Jones was one of six Pilgrims who made their Argyle debut in one of the three games of the abandoned 1939-40 season. Born in Barnsley, the wing-half played football locally for Wombwell in his youth before signing for Huddersfield Town in 1932 – then top-flight giants. He found a first team breakthrough difficult and left after two years to sign for Barnsley. In a three-year spell at Oakwell he fared considerably better and made 57 League appearances before dropping down to sign for ambitious Southern League side Chelmsford City in 1938. City had reformed that year from the defunct Chelmsford FC and were set up as a professional club with view to obtaining a Football League place. It was from Essex that Jones arrived at Home Park in 1939 and his debut turned out to be his only appearance before war broke out. He was allocated war work with Marconi in Essex and played as a guest for Fulham for all of the war years, returning to Plymouth to play for Argyle in the 1945-46 Football League South season before resuming in Division Two the following year, at the age of 32. Initially a regular right-half for the first two League campaigns after the war, he then lost his place and left Home Park to return to Essex to sign for Southend United in 1949, for whom he played 29 times. After leaving The Kursaal – five years before Southend moved to Roots Hall – he signed for League new boys Colchester United in 1950 and in a two-year stay he played 71 times and played a key role in establishing the club in the League along with former Argyle goalkeeper George Wright. It was here that he reverted to his early right-wing role, perhaps a surprise for a veteran, and was likened to a lower league Stanley Matthews. After leaving Layer Road in 1952, he signed for near-neighbours Ipswich Town in 1953, although no further League appearances are recorded.